Roadkill looks at multiple timeframes simultaneously, and then provides entry signals based on both Hawkeye Trend and Hawkeye Volume. It works on TradeStation, NinjaTrader, MetaTrader4, and is available on TradingView as a subscription-only model. NOTE: Requires the Hawkeye Trend and Volume Modules. Roadkill looks at multiple timeframes simultaneously, and then provides entry signals based on trend and volume. One of the biggest problems traders face is that whenever they see a signal or set up in one timeframe, they immediately look at a lower or higher timeframe chart to validate the signal for the confidence to enter the trade. This is a classic problem, and one that can be seen on virtually every trader’s screen, which can be cluttered with several charts, all with different timeframes and all giving different signals to the confused trader. Ultimately, the trader loses both money and confidence, and is no longer able to trade. For example, if you are looking at a daily chart, does the weekly chart also suggest that your trade is valid? Or, if you are looking at a 15 minute timeframe, does the one-hour chart confirm your analysis? Often the two charts will differ in their signals, since a trend that has begun in one timeframe, may already be ending in another. So you have two clear signals to get you into the market in your preferred timeframe. 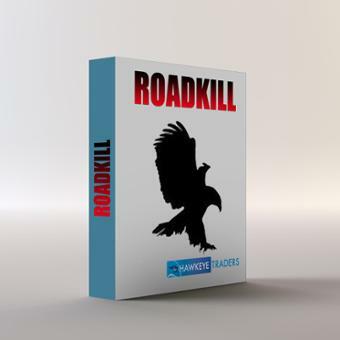 Even more powerful, the Roadkill indicator also works on the Hawkeye tick charts, so you have an entry signal based on volume — something no other software company in the world can offer.